I got some chess stories for you here. Sorry, but chess players are funny creatures. On a cold day in December 1943 two chess players were sitting in a coffeehouse in Berlin playing each other and were deeply immersed in the calculations of various chess variations in their game. The Allied Forces were bombing the city heavily and suddenly there was a terrible big noise outside, right in front of the coffeehouse. Something must have been hit and blasted away. "Bloody noisy outside today! ", murmured one of them deeply in thought. "Shut up, damned!" After about ten minutes the other one said: "It's very cold in here! Why, for christ's sake, can't they turn up the damned heating?" After the game was finished they went in direction door. The room seemed to be somehow bigger as usual. "Hey, there is something wrong here, don't you think? I can't find the door." It was already late at night and dark, they went further and suddenly they were standing on the road. They had a look around and were amazed to see, that the forefront of the coffeehouse was completely missing and that a lot of houses were completely destroyed. The strongest Move I've ever seen! You will agree that this game is just incredible. The following game was played in London 1927. 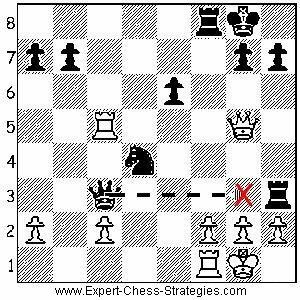 Now finally Black realized that he had moved the king to e7 before and not of the queen. Mister Rogers woke up as he heard a noise coming from outside the bedroom. He got up slowly and sneaked to the door of the living-room. He opened it carefully. The lights were on and he wondered if he had forgotten to turn them off last night. He entered and saw suddenly a burglar sitting at his desk. The man was dressed in black, studying a position on the chessboard that Mr.Rogers had left there last night. Last evening before he went to bed Mr. Rogers had set up and replayed a game from the American chess genius Paul Morphy. The position that has fascinated him, was still on the board. He went back slowly to another room, opened a drawer, grabbed the pistol that was put aside here years before, just in case. Then he went back to the living room terribly nervous. Something like that never had happened to him before. "Hey!...you! What are you doing in my apartment? Who, the hell, are you?" "This rook sacrifice here is just ingenious", the stranger said. "Morphy was the greatest..oh yes..he surely was." Mr. Rogers came closer, his hand shivered a bit as he cramped his fingers around the pistol. "But Black could have defended better", the stranger continued, starring at the board "simply playing king e7!" 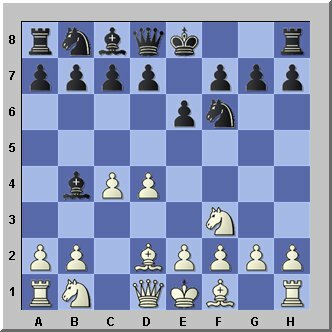 "That doesn't work because of Rook e6+," answered Mr. Rogers unfriendly, "and Black loses his queen or Morphy gets a devastating attack." "I don't believe that. Black can retreat with his king eventually and then he should be pretty save." "Let's see!" said Mr.Rogers came closer and had a close look at the board. This stranger seemed to be a good player because his move made a lot of sense, thought Mr.Rogers. He wondered why he didn't see this move himself last night. To retreat with the king looked a bit sick, but this move seemed to hold the position together. "This can't be! Morphy would have seen that move. There must be something else that we have overlooked." said Mr. Rogers excited. "Even world champions don't see everything", commented the stranger. Somewhat upset Mr. Rogers hand came down and put the pistol on the edge of the table. Was it possible that Morphy could have overlooked that? "But no! When the king retreats Morphy sacrifices his knight on f7! ", exclaimed Mr.Rogers getting really excited, "then the whole position will collapse." Mr. Rogers made the move on the board immediately. "Hmmm...yes...looks damned dangerous", murmured the stranger "but the position is unclear..."
"Unclear? Why? Move something!" Mr.Rogers encountered. "Well I don't have to recapture the knight, I can sacrifice the exchange on c3 instead. After that the attack is gone ...I got more material and win in the endgame." "Before the endgame the gods have placed the middlegame," recited Mr.Rogers a chessmaster. He couldn't remember from whom this quote originated but it seemed to fit well here. "and we are still in the middlegame!" Mr.Rogers continued and then he gave first a check with his knight and recaptured the rook afterwards. "Now you are finished! Your position is wrecked." exclaimed Rogers. "Yes..damned! I didn't see that! I haven't played chess for a long time. Okay! I better go now. I still have to work." The stranger stood up and went to the window while Rogers still thought about the position.. The stranger left finally through the open window and Mr.Rogers was still not quite sure if the king's retreat suggested by the stranger, was the saving move. When I tried to run him over, employing the Wolga-Gambit, I couldn't see the slightest reaction in his face. He was a real Russian chess bear and he stood there like a Russian wall on which every attack seemed to rebound. They called him „Kuzu“ and he has been eight times state champion. But I don't tell you in which country. This remains my little secret. Okay? I visited him sometimes on the weekends to play some testgames. Boy! He was a fighter, I tell you! To play him was like a fight for your life. I always had the feeling that his life depends on every move. He was very serious about every game. and won more games than I did as he was stronger, but it was very interesting and a great adventure for me to play him. He was already sixty years old but he still played the most devious, poisonous and strong chess that I knew at this time. But I really became fearful when he opened a little box took some pills out and swallowed them usually after an hour of playing, right in the middle of the game. I thought: Don't make a strong move now or he gets a heart attack and drops dead off his chair. I know this sounds funny, but it wasn't funny at all. In fact, I felt really sad, very sad in those games. This happened quite often that he swallowed those pills, when we were right in the middle of incredible fights, but after a while I got used to it. When I think about those times almost twenty years ago I still feel deep respect for this man. I know that I will never forget him and he must be dead by now. I think in every man's life there are some people you just don't forget. And he was one of them I won't forget. He was a real fighter and didn't want to lose at all. When you played him you could really feel his intense fighting spirit. I never felt this before. I knew he would never ever give up chess, no matter what happens. Chess was part of his life and without chess he would have nothing and his life would be empty and senseless. He lived on his own in his old house and had no wife and no kids. I played two games against him in tournaments. The first one he won in a positional way as his positional feeling was much better than mine. But in the second game, a few years later, I was in a real fighting spirit when I heard that I had to play him and I didn't want to lose again. When the game started and he was sitting in front of me I remembered the weekends and what a strong fighter he was and I said to myself: Man! Now pull yourself together or he will take you apart, just like that. I thought that I might have some chances as I had studied his playing style in our weekend games. And I promised myself to show a real fighting spirit in this game. The same spirit he is going to show in every game he plays. I had the black pieces and we played a quiet Queens Indian game. The position stayed even for a long time. But after a few hard hours I started to feel he relentless will to win. This bothered me somehow mentally. It was like an invisible wall between us which seemed to be impossible to overcome. I just thought, if I give up now mentally then I will lose even if the position is still even. This had nothing to do with chess at all. It was just a matter of willpower. I understood now why Kuzu had to take pills for his heart. It must have cost him a lot of energy to keep up this intense willpower for a few hours. Up to this moment he had not taken any pills. I was happy about that. If he would have done that I probably would have lost, because the theoretical possibility that he could suffer a heart attack in my game would have completely paralyzed my mind.. The game just went along quietly until I could penetrate with my queen into his position. But this was not enough to win against Kuzu. I knew that. After pondering my next move I discovered by chance just one square that Kuzu had not protected at all. But this square seemed to be not important as it was in the corner of the board, the square a1. When I saw this square my mind almost refused and rebelled to think about it and dismissed it as pure nonsense and a waste of time to even look at it. How can I use this ridiculous unimportant corner square? I am sure Kuzu had thought the same way before or he would have protected it or would have made some other move. A1 was the only square that I could use. I forced myself to think about it. When I put my queen there I attack the important pawn at d4, I realized suddenly. It was like a lightning hitting my mind. Now I forced myself to look very deeply into this matter and my brain came to the following philosophical, psychological, spiritual and fundamental conclusion: When I play my queen to a1 the pawn on d4 can't be protected anymore! This means Kuzu's position will collapse and I should win. I couldn't believe it! Suddenly I felt a lot of energy flooding through me. I almost exploded internally. I wanted to jump up and run around the table but I controlled myself, grabbed my queen and almost screwed her into the square at a1. I just wanted to make sure that she gets there and stays there. When the queen hit a1 it made a strange sound. I was afraid to have made a hole in the chessboard but this was not possible, but I had this thought for a second. I said to myself: Hey Man! Be careful and behave yourself or they come and lock you up in the lunatic asylum. The very moment when my queen hit a1, there was a slight shock in Kuzu's face. I knew that he knew that the game was lost for him now. We played on a few moves then Kuzu resigned. I never have felt so much energy making a move like queen to a1. This was something special. My dear chess friend, don't forget the square a1! It could be your victory. There was a German chess player who used secretly the chess program Fritz in a tournament. Nobody knew how he did it. Maybe somebody else checked the moves with Fritz and gave him hand signs or something like that. He had nothing plugged in his ear or elsewhere. However, after a few rounds of winning every game he finally had to play a grandmaster. I am not mentioning any names here. "Checkmate in eight moves! "The chess grandmaster just smiled and didn't believe him. "Don't smile, but find out!" the player said. The grandmaster checked and it was true. The player won. This player had a performance in this tournament like a grandmaster at a rating of around 2500, but his own rating was only around 1800. The organizers decided that there must be something wrong with this player but couldn't prove it. In the end after a few months he got kicked out of his chess club and was not allowed to take part in tournaments anymore for some time. He gained a bad reputation among all chess players who knew him. 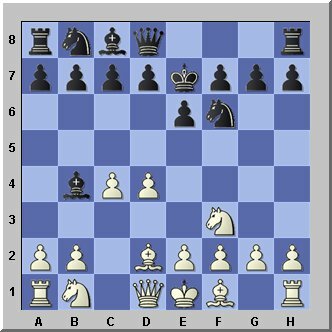 In the year 1912 Frank Marshall made the following incredible move 23...Qg3!! The spectators were so excited about this move that they threw gold coins on the chess board. Marshall (Black) threatens Qxh2 checkmate. If 24.hxQ Ne2 checkmate, if 24.fxQ Ne2+ 25.Kh1 RxR checkmate, if 24.QxQ Ne2+ 25.Kh1 NxQ+ 26.Kg1 NxR 27.gxR Nd2 and Black is a piece up and winning! Lasker received a box of cigars from a man, just before his match with Steinitz. The man said: "Smoke those cigars during the games. They will bring you luck." Lasker smoked one cigar before the match, but was disgusted because the quality of the cigars was very bad. So he threw the whole rubbish away. After he won the match he met this man again. "My cigars brought you luck, didn't they?" "Of course, they did!" said Lasker. "So, you did smoke them all?" "Not me! I gave them my opponent, he smoked them. And this brought me luck and victory." Lasker traveled to Paris, rented a room and visited the famous "Cafe de la Regence" to meet famous players. Lasker enjoyed himself very much until after midnight. Then he intended to return to his room but he couldn't remember the address anymore. He couldn't recall the name of the street and was embarrassed about this. Finally somebody invited him to sleep at his place. The next day he sent a telegram to a friend in London and asked him to sent him the address of his room. This was logical but he forgot to include an address in the telegram and so his friend couldn't sent him the answer. The day after Lasker searched methodically in the districts of Paris to find the room he had rented. After some luck he eventually found it. Quite happily he greeted the woman who opened the door. She had a piece of paper in her hands and gave it to him. It was the answer-telegram of his friend in London who had sent it to the address Lasker couldn't find, as he didn't know where else he should sent it to.